Pre-requisite for requesting TDS/TCS statement online. Online request for TDS/TCS statement can be made only on successful registration of TAN (creating TAN registration account) at TIN website. 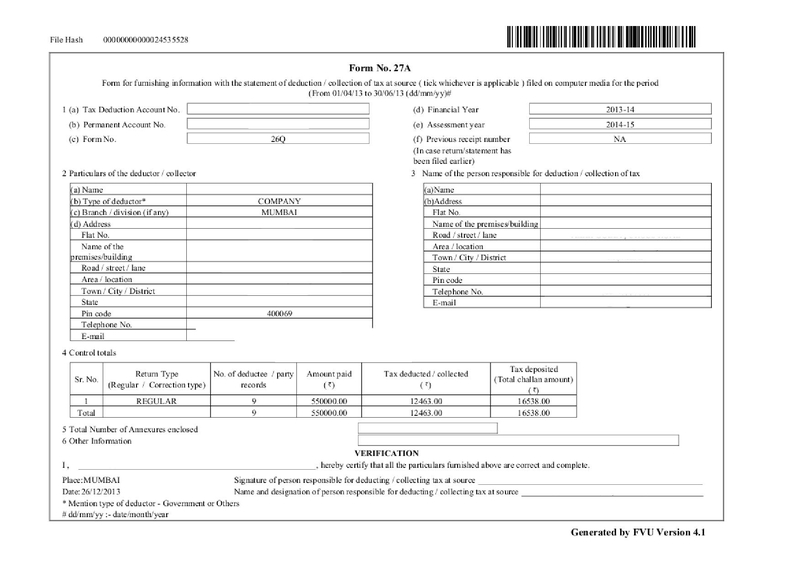 On successful login, under option TDS/TCS, select option “Request- Consolidated TDS/TCS statement”. Request for consolidated TDS / TCS statement can be made for your TAN only. On successful validation of the above details, two questions related to the TDS/TCS statement requested will be asked as a part of verification. On successful verification of answers to the aforementioned two questions, request number will be generated and the consolidated TDS/TCS statement will be e-mailed to the user on the email ID provided on TAN registration within 24 hours. Consolidated TDS/TCS statement will be available only if correct answers are provided to the questions for verification. Two attempts within a day will be provided to correctly answer the verification questions. In case of two unsuccessful attempts within a day for the same statement, request for such statement can be placed on next day. In case of large number of records in the TDS/TCS statement requested, the statement will be split in multiple files owing to restriction of mail size. In case TDS/TCS statement is split in multiple files then each file will be sent by separate e-mail. In case of single file, extract the content of the file by providing password to the file. In case of multiple files, merge the files using FMU and then extract the contents of the merged file by providing password. was to fill up Challan Sr No , date and amount.